In downtown Seattle there is a statue of communist Vladimir Lenin that stands 16 feet tall. The statue was originally on display in Czechoslovakia in the late 1980's, but shipped to Seattle Washington in 1994 after an American found it in a scrapyard in 1993. A teacher in Washington told friends and the media that he found a homeless man living inside the hollowed bronze statue. The goal of English teacher Lewis E. Carpenter was to keep it for its artistic merit. 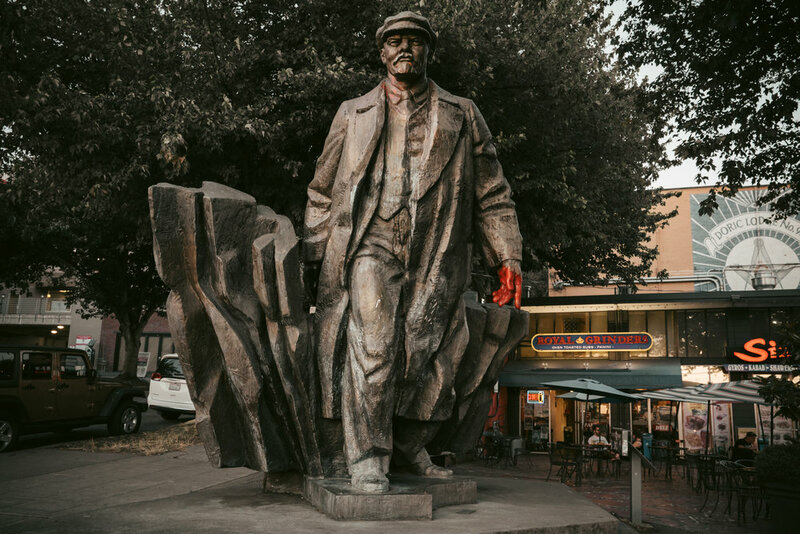 Carpenter also wanted to display the statue of Lenin in front of a Slovak restaurant in his hometown of Issaquah, Washington. However, he died in a car wreck before building his restaurant which means the statue never went up. In fact, the statue made it from Czechoslovakia to America shortly after his death. In the end, the statue was delivered and the family of Carpenter planned to sell it and have it melted down. However, the owner of a foundry in Seattle decided to have it displayed in the Fremont area of Seattle, Washington. In 1995, it was unveiled at the corner of Evanston Avenue North and North 34th Street. In 1996, it was moved up to Fremont Place and North 36th Avenue. In case you are wondering how much such a statue of a communist goes for... it is for sale with a price-tag of $250,000 on it. Yes, it is still for sale. On a side note, the English teacher who died before his dream was realized had to take out a new mortgage on his home to pay for the statue to be shipped overseas. That shipping rang in at $70,000. The cost of the statute however, free. I guess my question, art or not, why would you want a 16 foot communist leader in front of any business? Especially one that is believed to be behind mass killings during his rule over the Soviet Union. That is likely why ever since the statue went up in Washington State, people have painted blood on Lenin's hand and mouth.